House of Reggae located in Montreal, known for Reggae acts and food. Recently launched their brand new website. While in Montreal, you can check out Mello G and the band, Mikey Dangerous, Inword Band. House of Reggae is a classy live music showbar and restaurant with a beautiful outdoor terrace that features live performances every week with artists and musicians from across Canada. With an eccentric mahogany and live bamboo décor and a variety of Caribbean beverages and dishes, the House of Reggae is surely a unique among Montreal’s vast variety of showbars and resto-lounges. 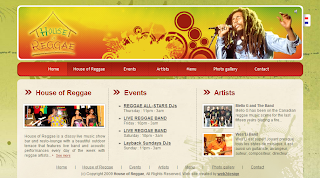 House of Reggae also offers freee Wi-Fi Internet on the terrace. The House of Reggae boasts a select of specialty Caribbean dishes, such as: Jerk Chicken Wings, Chicken/Veggie Roti, Ackee & Salt Fish, Jerk Chicken Brochettes, Fried Plantains, Jamaican Patties, Rum Cake, and more. The House of Reggae will also serve up traditional Caribbean beverages such as, Carib, Red Stripe, Ginger Beer, Mango Jus, Ting, Pineapple, Vita Malt, and others.